USED- MODEL 2800 VIVTAR HOT SHOE FLASH UNIT IN GOOD WORKING CONDITION. NO BATTERIES, OR ACCESSORIES SUPPLIED, BUT WILL REQUIRE 4 DOUBLE AA 'S. Vivitar 2800 Shoe Mount Flash in excellent condition! Great condition. Trending at $8.43eBay determines this price through a machine learned model of the product's sale prices within the last 90 days. For sale is a Vivitar 2800 Auto Thyristor. The box and instructions are included but the box shows signs of wear. The color lenses are in excellent condition. They are in plastic slots. prior to purchasing your item. Looks unused. Complete with box, instructions and five filters (one had slipped out of the holder in the picture, but it is present). HERE IS AN EXCELLENT VIVITAR 2800 THYRISTOR FLASH UNIT. VIVITAR 2800 FLASH. Last it was used it worked fine. Batteries NOT included. Smoke free house. OF NOTE: This Vivitar Auto Thyristor 2800 flash has been tested and is in working condition. Options for adjusting the Vivitar flash are using its manual settings or letting it auto-focus. About the Vivitar 2800. Clean and in generally very good condition, tests OK. Made in Japan. Requires four AA batteries, not included. Flash Lens Pretty Clean ). (vague surface marks/scratches. Vivitar 2800 Shoe Mount Flash. Condition is Used. Shipped with USPS Priority Mail Small Flat Rate Box. 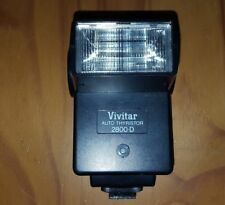 Vivitar Auto Thyristor 2800 shoe mount flash. Pre-owned, in great condition. Vivitar 2500 Auto Thyristor Bounce Shoe Mount Flash SLR Camera - Tested Good! Fires correctly when placed in the hotshoe of my fuji xt-1. Vivitar 2800 Auto Thyristor Electronic Bounce Camera Flash - Tested & Works! 4.5 out of 5 stars - Vivitar 2800 Auto Thyristor Electronic Bounce Camera Flash - Tested & Works! 18 product ratings18 product ratings - Vivitar 2800 Auto Thyristor Electronic Bounce Camera Flash - Tested & Works! Used flash in Very Good condition. Tested and working. Runs on 4 AA batteries. Only a few minute blemishes. 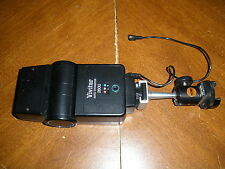 Vivitar Auto Thyristor 2800 Electronic Flash Shoe Mount. Condition is Used. Tested and working. Shipped with USPS Priority Mail. Whether illuminating objects from a long distance or right up close, this device provides an ample and adequate amount of light that is just right for nearly any type of photo you plan to capture. Options for adjusting the Vivitar flash are using its manual settings or letting it auto-focus. Here is a great item. This flash is in good physical and working condition - ready light no longer works but does not effect the functionality of the flash. Vivitar 2600-D Auto Thyristor Flash. In good shape with light wear. Tested and works fine. As pictured. Very cool Check out our other items for more great deals ! 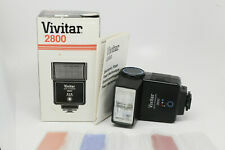 Vintage Vivitar 2800 Auto THYRISTOR ELECTRONIC FLASH. Condition is Used. Shipped with USPS. Vivitar 2800 Shoe Mount Flash with manual. Condition is Used. Shipped with USPS Priority Mail Small Flat Rate Box. Everything tested and working. Runs on 4 AA batteries not included. Flash is tested and in good working condition. This item has been tested and functions as it should. This is the actual Vivitar 2800 - Auto Thyristor Electronic Flash you will receive. For sale is aVivitar Auto Thyristor 2800. This item has been tested and it is fully functional. The batteries are NOT included. -Minor/scratches wears on the item. The flash with MPN #9065876 has a cable as shown in the pictures. The other flash with MPN #3118779 does not include the cable. VIVITAR AUTO THYRISTOR 2800-D FLASH.